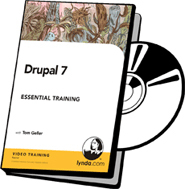 In almost seven hours of video instruction, Drupal 6 Essential Training (originally titled “Drupal Essential Training”) covers all the important aspects of installing, configuring, customizing, and maintaining a Drupal-powered website. 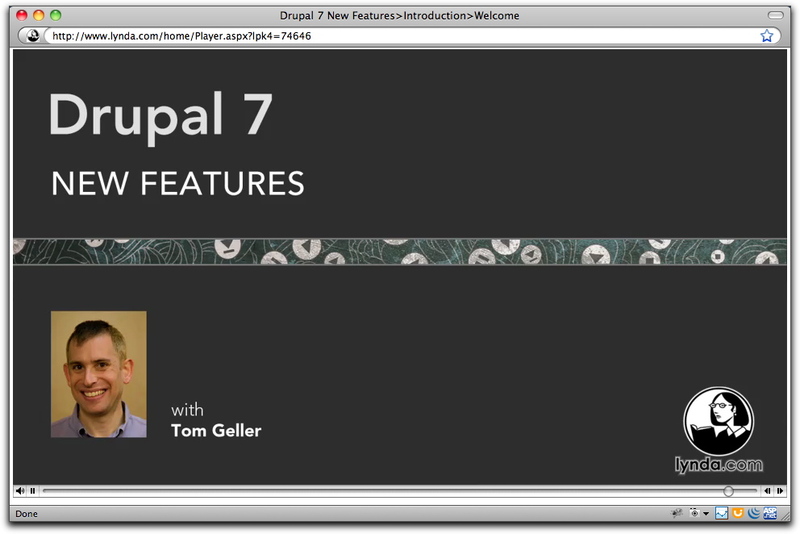 Instructor Tom Geller explores blogs, discussion forums, member profiles, and other features while demonstrating the steps required to make Drupal perform. 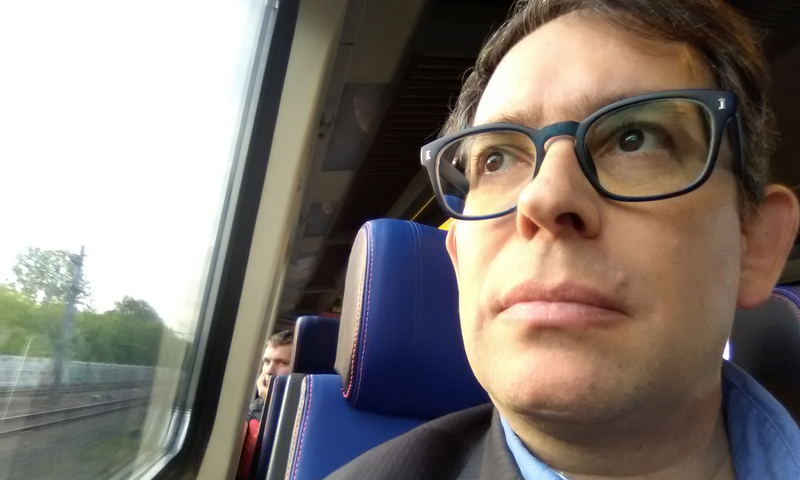 He also teaches fundamental concepts and skills along the way, including installation, backups, and updates; security and permissions; flexible page layouts and CSS; menu navigation; and performance monitoring and disaster recovery. He also discusses how to select and install the community-supported modules that further expand Drupal’s capabilities, and gives experienced PHP programmers tips on customizing page templates. Example files accompany the course. Drupal’s built-in data presentation tools offer several ways for web designers to clearly and attractively package their data. 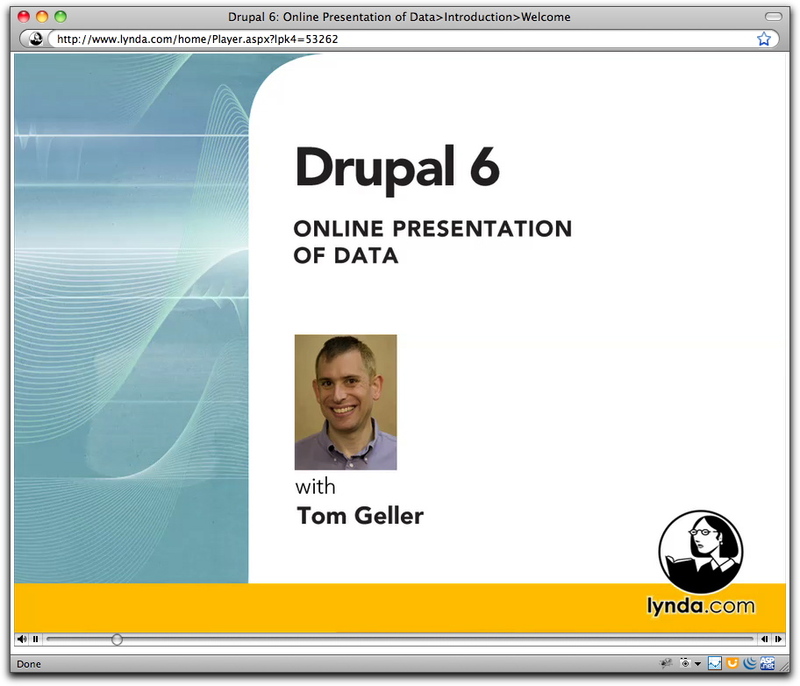 In over six hours of video training, Tom Geller explains how Drupal handles data so users can set up intelligent structures and implement them with Drupal’s Content Construction Kit. Tom also shows how a data-driven web site can improve its interactivity by using geographic data to connect real-world addresses to maps. Exercise files accompany the course. Over two and a half hours of video that demonstrates changes to the Drupal 7 administrative interface and other enhancements that have come out of its three-year development period. This course covers its simplified installation process, new themes that will help kick-start design projects, the customizable shortcut bar that puts often-used commands in easy reach, update procedures that leverage its browser-based interface, and a new way of defining fields to create complex content types without additional modules. Over five hours of video training that demonstrates how to create and publish a complete web site with the powerful tools in Acquia’s hosted service, Drupal Gardens. The course covers how to leverage its pre-built page layouts and add custom styling, without having to learn CSS, using the Theme Builder tool, how to integrate rich site features, such as forms, surveys, and media galleries, and how to push content to Twitter and Facebook. The course also shows how to transition a Drupal Gardens site to a self-hosted Drupal site. Exercise files are included with the course. Over seven hours of video training that shows how to get the most out of Drupal, the content management system (CMS) that powers over a quarter million web sites. The course demonstrates how to download and install Drupal, add content and graphics to a site, change layout and design elements, control visitor interactions, and expand the site’s capabilities beyond what’s available in Drupal core. Discussion of established best practices in each step to ensure that a site remains streamlined, secure, and up-to-date. Exercise files are included with the course.